Verbs are the most complicated part of learning Spanish, and Spanishpod101 knows this very well. They have created a system where you can practice verbs on every lesson you take, which is the best way to learn and remember them. The more you practice, the more acquainted you become and the easier it will be for you to remember how to use them in Spanish. Under your Lesson Materials’ Grammar tab, on your online Spanishpod101 lesson, you will find the Introduced and/or the Used Verbs sheets. Once you open this tab you will find the category, the level and formation for all the verbs used. On the Formation box of your Spanish pod 101 Spanish lesson you can practice the present tense and Singular and Plural forms. It also includes specifications for gender and form (Formal or Informal), sample sentences and notes with further explanations for better understanding. If you decide to study some more about this particular verbs, the sheet also offers Related Lessons where you can practice. It provides you with a list of Spanishpod101 Spanish lessons that work with the same or similar verbs. 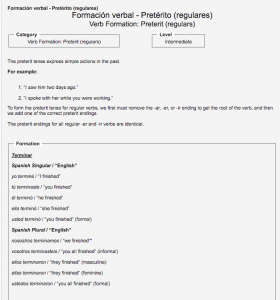 Spanish pod 101 also offers a quick overview to Spanish verbs (About Spanish Verbs) under the “Spanish Resources” tool. Here you can learn the basics about Person and Number, Tense and Aspect. I also found a helpful tool under the same “Spanish Resources” tab on my personal dashboard: Verb Conjugation Chart. This valuable Spansish pod101 application allows you to search First, Second and Third conjugations PLUS irregular and “defective” Spanish verbs. Each table clearly explains each verb’s tense and mood (indicative and subjunctive with their singular and plural forms). 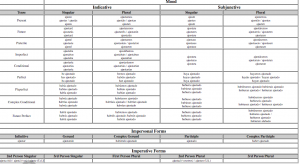 Spanish pod 101 lessons makes it easy for you to print this tables for further practicing. You know practice makes perfect, so why not use this resources to gain more confidence with your newly learned Spanish ? 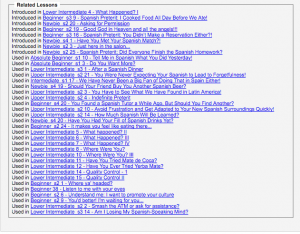 Spanishpod101 gives you numerous tools so you can improve your knowledge on a daily basis. It is up to you to take full advantage of them and become a Spanish expert in a short time.